Much like death and taxes, Lego constructs are an inexorable part of the natural order of things: If something really spiffy has been made in the real world, you can be certain a Lego replica will eventually follow. 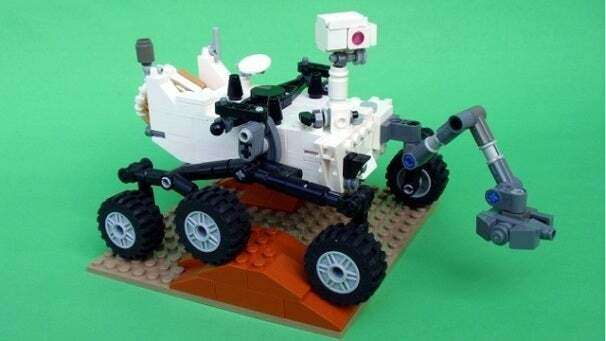 Needless to say, a Lego-based recreation of the Curiosity Rover on Mars is already a thing. A mechanical engineer that goes by the name of Perijove on Lego Cuusoo is the guy responsible for this model of the Mars Science Laboratory's rover. Though his version is not quite as snazzy as the real thing (the real Curiosity is over seven feet tall, weights almost 2000 pounds, has 165 pounds' worth of scientific instruments on-board, and is capable of shooting freakin' laser beams), it's still highly impressive. The Lego Curiosity Rover has "a fully articulated arm, a deployable mast, a working rocker-bogie suspension that allows it to climb over large rocks and keep all of its wheels on the ground'. Lego enthusiasts who enjoy building such things themselves will be happy to know that both a step-by-step instruction manual (link to the PDF) and a Lego Digital Designer model (direct link to the file) are available online for the low, low price of zip, zilch, zero. As an added bonus, Perijove also has a photo gallery dedicated to a Lego model of the Mars Science Laboratory Powered Descent Vehicle. Sadly, there are no instructions for this one, but who knows what the future will bring?